Windows Talk details a ‘sensible and economic way to protect your data’. The theft or loss of desktops, laptops, smartphones and tablets, USB keys and portable hard drives are all too commonplace these days. Much of the information stored on these devices can be used for identity theft and breaches of privacy. Indeed, in healthcare organizations alone, a lost or stolen computing device is the primary cause of data breeches, according to the Ponemon Institute. Software encryption is a powerful and valuable risk management tool, whether in the business world or in the realm of personal computing. Encryption converts readable data to an unreadable state and is a sensible and economic way to protect your data. 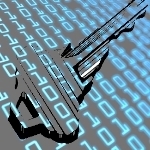 Why you should use data encryption? Encryption makes it difficult for an unauthorized party to access the data, source, attachments, and content that has been shared over a network or an Internet connection. Forming a security shield across your digital content, the encryption technology can cause significant delay in the exposure of that data to unintended persons and in this way provides ample time to save yourself. Moreover, most privacy experts agree that when hardware containing sensitive information is lost but secured by strong (hard to decipher) encryption, there is no actual loss of information.